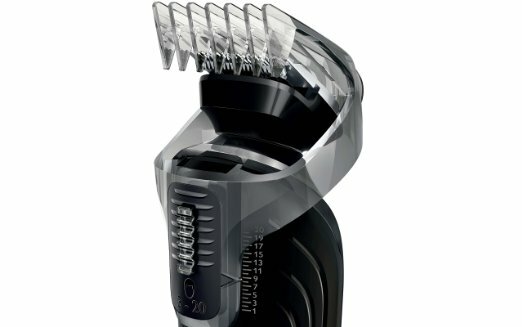 The turbo-powered grooming kit, the Philips Norelco Multigroom 5100 takes care of your hair grooming needs in style. 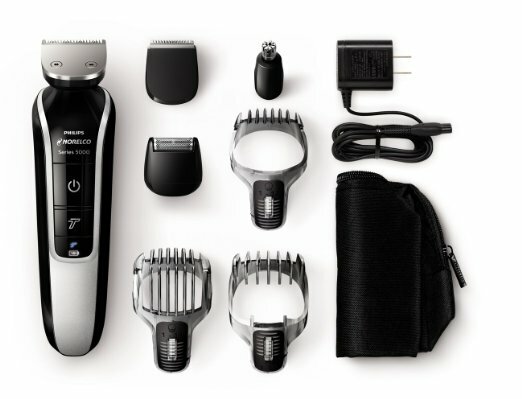 This all-in-one multi-groomer has seven tools for head and face styling, including a hair clipping comb, full-size metal guard trimmer, stubble comb, beard comb, detail trimmer, mini foil shaver and nose trimmer. You can choose any style you want using the 18 build-in length settings. The battery is rechargeable Lithium-ion which requires one hour of charge. It comes with a full 2-year warranty and a 45 day risk-free trial. Groom your mustache, beard, sideburns and head with this all-in-one trimmer. The seven unique attachments give you the freedom to choose different, daring looks for your face and head. You can trim to an exact length using the 18 built-in length settings. The self-sharpening blades, the skin-friendly rounded blade tips and combs, the exclusive turbo boost make it a good grooming kit. The battery is built to last, lasting up to 60 minutes. It is easy to use and clean, you just need to rinse it with water. For an even beard, use the full size trimmer with an adjustable comb length between 1mm and 18mm. Helps you create fine lines, details and contours. You can trim unwanted ear and nose hair, comfortably and easily. Helps shave your cheek and chin hair for a clean, finished look. If you like experimenting with different hair lengths for your beard, the hair comb is your ally. It offers 18 length settings from 3mm to 20mm, each setting increasing by 1mm. If you like your dark stubble, you can keep it neat with the stubble comb. There are 12 length settings from 1mm to 12mm, each setting increasing by 1mm. There are two convenient options – get 60 minutes of running time for a shave and trim by charging for 1 hour, or get one full trim with a five-minute quick recharge. This setting increases the power so even the thickest hair can be trimmed. The longest, most dense parts of your hair can be cut by using Turbo Boost. The fine beard trimmer leaves fairly visible unshaven hairy spots. Sometimes the trimmer is inefficient in its trimming and needs many passes. The trim length selector does not switch smoothly. The trimmer is very unforgiving and cuts the skin a few times. Long term users (around six months) have complained that the attachment locking mechanism wears out quickly. This means the beard trimmer is useless because no attachments will stay in place. The trimmer grabs hairs, does not give a clean, precise shave. The Norelco Multi-groomer is offered at a competitive price from various retailers and is easy to get. It comes with many convenient attachments and length settings which show attention to detail. It is easy on the skin, built to last and comes with a travel pouch. 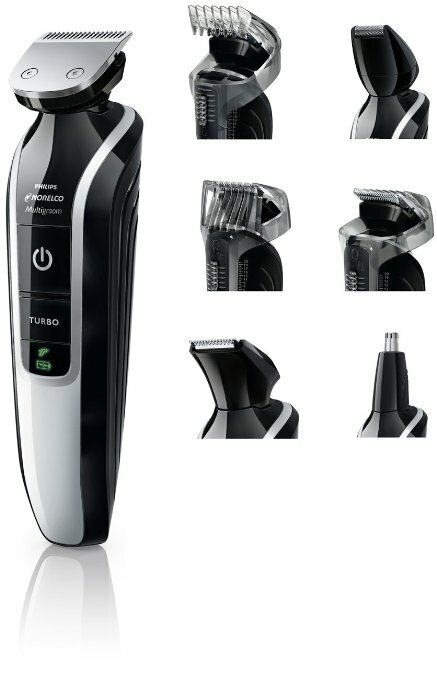 Buy this if you are looking for an all-in-one grooming kit.